Chick This Out! | Food It Yourself! We’ve had another rainy week here in central New England. I did, however, manage to plant some lettuce and some other greens. Hopefully the seeds did not get washed away. I also started some peppers and tomatoes outside in little mini green houses. Yes, those are disposable plastic cups. They make really good mini greenhouses, though. 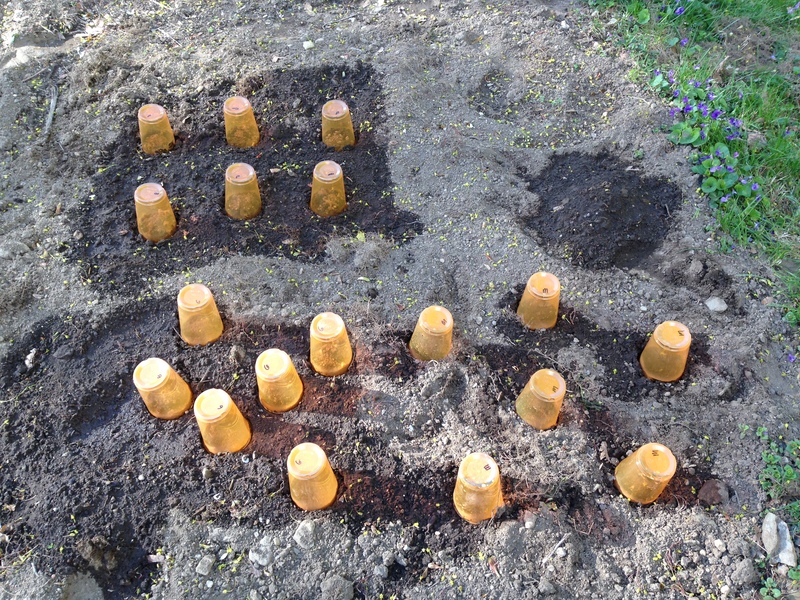 I was even smart enough to label the cups so I know what was planted where. I harvested just over two pounds of rhubarb, some of which has already become barbecue sauce. 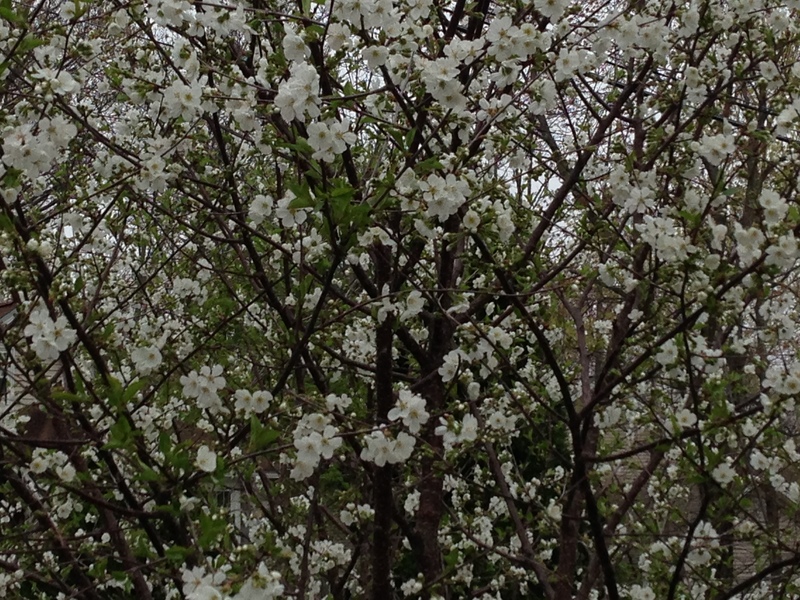 The cherry trees are blooming magnificently, but with the rain I am not sure how many flowers will be pollinated. 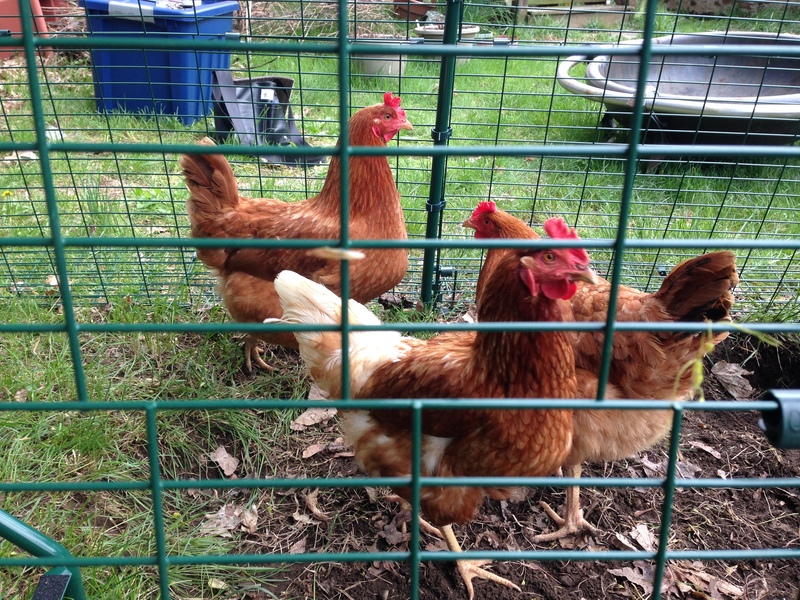 Also, we have acquired chickens. Yes, Mr. Food It Yourself and I finally have a small flock of lovely egg producing chickens. Mr. Food It Yourself raised chickens for many years when he was growing up in Worcester, MA. (It’s the second largest city in New England, unless a few more people have moved to Providence RI in the past week.) We considered purchasing chicks, but bringing up chicks is a whole other ballgame that we don’t quite have the space for that yet. Thankfully, I happen to know one of the owners of Lady Bug Farm Produce, a really great organic farm in Hubbardston, MA. She kindly sold us “grownup” chickens. Not only are these birds already acclimated to the local weather but we are 100% sure they are all hens. Roosters are loud. Even if you buy “pre-sorted” chicks there is still a chance you’ll get rooster among the hens; the sorting methods are not foolproof. I learned this from the staff at my local agricultural supply house. See how important asking for advice can be? Back yard chicken keeping is becoming a popular hobby in urban and suburban areas. There are plenty of websites offering resources if you are thinking of getting a flock. The aptly named site Back Yard Chickens has information, a blog, and a public forum for hobby chicken keepers of all skill levels. I already created a free account. They also offer a paid account for even more chicken-related awesomeness. The Poultry Site (also an apt name) is mostly geared towards commercial chicken raisers. However, the Knowledge Center has very good information on poultry health and welfare that translates to backyard coops. Yes, even the government wants to help you help your chickens. You probably have a local County Extension Office near you. These satellite offices of the USDA can help you with chicken-related issues that affect your area. Use this link, or do a search for “your county, your state” and “extension office”. Most importantly check your local codes, regulations and by-laws. Serously, this is probably the most important thing you can do before purchasing chickens. The rules vary widely from town to town, even within the same county. The town I live in has very few animal related bylaws, and no bylaws regarding the keeping of chickens. A few towns away, keeping backyard chickens is prohibited entirely. At the publishing of this blog we have had our chickens for just over 24 hours. We already collected three eggs. I am totally in love with them. Just watch! At some point the ground will dry out and we’ll have consistently warm days and I’ll get my tomatoes planted and I’ll start complaining about how much zucchini we have. Until then I’ll be listening to my mini-flock and planning my final push for the Food It Yourself Garden 2017. How is your growing season so far? Share in the comments section!